Chinese water dragons (hysignatus cocincinus) are distinctive looking green lizards native to China, Cambodia, Vietnam and Burma. They have distinctive large eyes, giving them a character-filled, expressive face. The eyes are a good indicator of general health. If your dragon has closed his eyes and won’t open them, monitor the accompanying symptoms. If they remain closed for more than a day, consult a veterinarian. If you notice your dragon closing one or both eyes when being handled, he’s simply “hiding” from you. This is a common quirk of the Chinese water dragon. You can test whether he’s hiding by monitoring his eyes when he is close and far away. If he only closes his eye when in close proximity to you, it is simply a case of him being a little scared of being handled. When wild dragons are frightened or nervous, they take refuge in the water. Once submerged, they cannot see the cause of their stress. It is plausible that closing the eyes is a stress-reduction technique adapted from their habit of submerging. If you’ve been feeding your dragon lightning bugs, it’s possible that one of the bugs has bitten him in the eye. These bugs are not really suitable as food, due to their capacity for biting. If you’ve fed your dragon any lightning bugs, remove any uneaten ones from his enclosure to ensure he doesn’t suffer further injuries. Chinese water dragons shed their skin in patches, rather than in one piece like snakes. Just prior to shedding, the skin on your dragon’s eyelids will bubble up. This may cause his eyes to close until the loose, ready-to-shed skin is off. Do not attempt to remove the skin manually, it will fall off of its own accord. Respiratory infections can lead to a crustiness around the dragon’s eyes. Accompanying symptoms of a respiratory infection include labored breathing, a whistling sound coming from the nose and lethargy. In severe cases, this crustiness may cause the eyes to stick shut temporarily. If this remains the case for more than a day, take your dragon to a veterinarian. 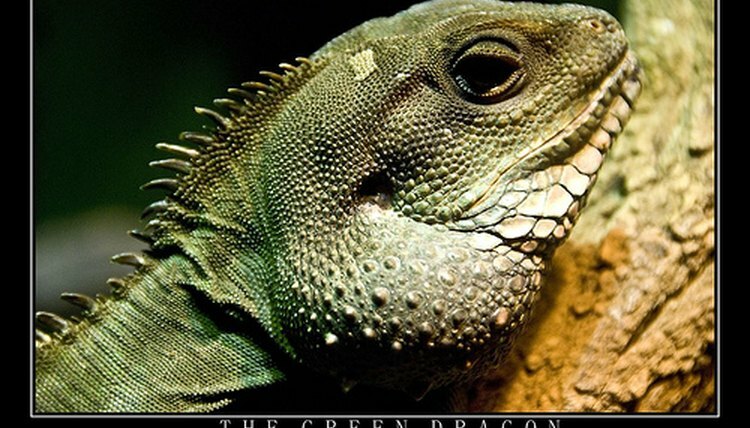 Chinese water dragons have a light-sensitive third eye on the top of their head, called the parietal eye. This eye is not capable of vision, but it does play an important function. It measures how much light the dragon is receiving and controls hormone production. In the wild, when the dragon has been exposed to sunlight for too long, the parietal eye adjusts hormone production, enabling the dragon to regulate his own exposure to sunlight. However, if the lighting in your dragon’s tank is too bright or powerful, he may resort to closing his eyes to reduce glare. This is especially likely if he is unable to get shade in the tank.